The offseason is over and real baseball has started. The main course has finally arrived after the hors d’oeuvres of the Mariners/Athletics opening series in Japan. The teams are set — pace, Dallas Keuchel and Craig Kimbrel — and my last bit of ZiPS business is to put on record the final projected standings for the 2019 season. These are computer-generated projections, remember, and as a result, they certainly do not reflect which teams I hate and which teams I like. If they did, I clearly would not be considered very effective at applying my personal biases, having grown up in Baltimore, booing the Yankees. Also note that there’s a new little chart I’m including this year that I’m dubbing the “division matrix.” Essentially, one of the least understood things about the projected mean standings is that they are mean projections and not necessarily the win totals that will actually win the division. Take for example, the NL East. The Cubs have the best projected record at 87-75, but that doesn’t mean that on-average they’ll win the division by winning 87 games, because not all teams simply perform to their mean projections (nor does ZiPS expect them to). So on the division matrix, the 90th percentile means that 10% of the time, the divisional or Wild Card winner will have at least the number of wins listed. The standings also do not reflect the two wins for the Mariners and two wins for the A’s. I felt it was kind of cheating to include them in preseason projected standings. But I also didn’t want to make the final projected standings before those games took place, as teams have made about 10,000 small moves since then, keeping me awake and in our depth charts 24/7 for the last week. And I really shouldn’t have to mention it in the current year, but 0.0% is not literally 0.0%. 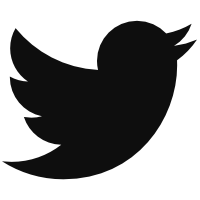 It’s rounded. So Marlins fan, I’m saying there’s a chance. Well, they did it. The Philadelphia Phillies signed Bryce Harper to a 13-year, $330 million contract, reported with no opt-outs, opt-ins, options, opt-arounds, or any other sort of contract-related shenanigans. The Phillies have been circling this offseason in their diaries for years, the winter that a flood of awesome free agents would hit the market and the team could splash some cash and add a build-around star or two. The plan largely went as designed. The Phillies went about their rebuilding business in a disciplined and careful fashion, seizing an opportunity or two as they popped up along the way (for example, a depressed market for Jake Arrieta and the availability of Jean Segura in a trade). Not all the free agents who hit free agency this winter did so in as exciting a manner as expected — players like Josh Donaldson and Dallas Keuchel saw their stocks drop, and Clayton Kershaw didn’t even test the market — but Bryce Harper and Manny Machado still tested the waters, with both expecting to end up with contracts near or exceeding $300 million in total value, and $30 million a year. If you’ve perused FanGraphs’ player pages this morning, you may have noticed that the 2019 ZiPS Projections have now officially been added into the database, with players all projected based on their most recent organization as of late Sunday, February 24th. ZiPS projections are also now included in this season’s Projected Standings, mixed in along with the Steamer projections. So if you find yourself with a particular urge to praise or curse your favorite team’s projected record today, that might be why. Coming up, at a date still to be determined, will be the 2020 and 2021 projections from ZiPS. While ZiPS has spit out multi-year projections since about 2006, I’ve generally greedily hoarded those projections for my own nefarious uses, but even Ebeneszym Scrooge can occasionally see the light. I will not be buying a Christmas goose for Tiny Tim Collins, however. The WAR listed for players on the ZiPS 2019 projections page has also been moved over to the FanGraphs WAR, in order to be consistent across the website, allowing you to compare apples to apples instead of apples to battleships (apples and oranges aren’t really that different, after all). The Yankees have overtaken the Red Sox for the most projected wins in baseball with 98, up from 96. Boston, meanwhile, drops a win, going from 96 to 95. That’s not a lot, but it is enough to push their projected win total behind that of the Astros, who now have the second highest projected win total with 96. The Marlins now have the (dis)honor of baseball’s worst projected record with a paltry 62 wins, slipping behind the Orioles. The Brewers got their expected ZiPS bump, as they did last year, with ZiPS simply being more of a believer in the adequacy of their starting pitching than most. Stirring ZiPS into the stew is enough to get the Brewers above .500 and into third place in the NL Central, above the Pirates and Reds. Even after all the other teams have gone live, ZiPS still holds a special place in its hard drive for Cleveland’s rotation. Especially notable is Shane Bieber, who ZiPS projects as 13th in WAR among pitchers, meaning the computer loves Bieber more than you or I have ever loved anything. And that’s still only good for fourth best in the rotation! One can perhaps understand why the Indians were open to trading Corey Kluber. Most pitchers would be very happy with a 3.9 WAR projection, but I believe this is the first time Clayton Kershaw’s has dropped below that in ZiPS since his rookie season. ZiPS sees third base as the most talented position on the field right now, with the five players projected at five WAR or greater and a whopping 11 players projected to hit the four WAR margin. That’s out of only 13 and 34 total position players respectively. So enjoy the projections and remember: even if Carson Cistulli is no longer with us here at FanGraphs, he can still be at fault for all the projections that are wrong. Is there something you’d like to see in ZiPS on FanGraphs? Let us know! After having typically appeared in the hallowed pages of Baseball Think Factory, Dan Szymborski’s ZiPS projections have now been released at FanGraphs for more than half a decade. The exercise continues this offseason. Below are the projections for the Chicago White Sox. If only an outfielder was available in the free agent market, one who could bring a significant boost to a contending team! Shoot, I’m self-plagiarizing. Let me try again. If only an outfielder was available in the free agent market, one who could bring nearly as much of a boost to a rebuilding team as Bryce Harper could! After having typically appeared in the hallowed pages of Baseball Think Factory, Dan Szymborski’s ZiPS projections have now been released at FanGraphs for more than half a decade. The exercise continues this offseason. Below are the projections for the San Diego Padres. There’s no way to talk about the Padres’ offense while ignoring the elephant in the room, San Diego’s big infield acquisition this winter. I’m talking, of course, about Ian Kinsler, who remains one of the most underrated players in baseball. The last time Kinsler failed to put up two WAR in a season was 2006, and even as his bat has declined — to a wRC+ of 93 in 2017 and 87 in 2018 — his glove has continued to add a whole win to his bottom line. He’s a really good transitional pickup as the Padres shift towards their Luis Urias/Fernando Tatis-based future. Oh, right, you probably want to hear about the other dude! Manny Machado projects better as a third baseman than as a shortstop. Simply put, based on his age, his brief history at short and more lengthy one at third base, and a few other indicators — when you know nothing about a player, generalized speed data does have a relationship with defensive performance — Machado played worse defense at shortstop than ZiPS projected going into 2018. While we’d need to see a few years of him back at third to know whether this was due to a general defensive decline on his part or something shortstop-specific, ZiPS believes he’s a bit more valuable at third right now. After having typically appeared in the hallowed pages of Baseball Think Factory, Dan Szymborski’s ZiPS projections have now been released at FanGraphs for more than half a decade. The exercise continues this offseason. Below are the projections for the Chicago Cubs. After having typically appeared in the hallowed pages of Baseball Think Factory, Dan Szymborski’s ZiPS projections have now been released at FanGraphs for more than half a decade. The exercise continues this offseason. Below are the projections for the New York Yankees. ZiPS may be low on Voit, but 2.4 WAR per 600 plate appearances is an above-average first baseman, and Voit doesn’t have a long track record of excellence. It was only in 2017 that ZiPS started being interested in him, seeing his combined major league time and minor league translation as a .283/.352/.481 line. In 2018, the combined line was .284/.361/.516, not all that different in the big picture. Voit’s not a young player, and while he has hit very well in the majors, a player’s minor league career doesn’t just evaporate the second they hit the bigs and rock the league in a cup of coffee (see: Chris Singleton or Shane Greene). The Yankees appear to have an almost Dodgers-like level of flexibility, with a number of infielders who can theoretically play every other position on the diamond. It’s a bit of over-engineering, but ideally, top teams should accumulate depth in this manner. I’d argue that the Phillies ought to have tried to sign Mike Moustakas, though he may not have been all that interested upon realizing that he’d basically be the team’s backup in the event Manny Machado cares to sign. After having typically appeared in the hallowed pages of Baseball Think Factory, Dan Szymborski’s ZiPS projections have now been released at FanGraphs for more than half a decade. The exercise continues this offseason. Below are the projections for the Minnesota Twins. In a league that is largely dominated by teams at the extremes of winning and rebuilding, the Minnesota Twins represent an increasingly rare breed: the excruciatingly, unbearably, average team. If you look at the lineup from top to bottom, there just aren’t any horrible weaknesses, with the bottom of the ZiPS ranks (Jorge Polanco, and the catching and first base timeshares) still living in the neighborhood of league-average; no scary negatives or zero-point-somethings lurk in there. But the highs aren’t really that high, either; Nelson Cruz tops the projections at 2.6 WAR, thanks to a .266/.348/.500 line. That’s the lowest top projected offensive WAR for any team that hopes to be a realistic contender in 2019. This situation is not entirely the team’s fault, of course. ZiPS, like the Twins and most prospect-watchers, thought that Byron Buxton and Miguel Sano would, by this point, be players who formed the core of Minnesota’s lineup. There are a number of valid criticisms of how the Twins have managed Buxton and Sano, especially the former. Buxton’s inconsistent performance has been maddening, but so has the team’s tendency to go back-and-forth on whether he needed to be in the majors or the minors at any given time. His regular injuries add another frustrating complication. ZiPS has generally been optimistic about Buxton’s future, even when he’s struggled in the majors, but at this point, it’s only buying him as a league-average overall performer thanks to his excellent glove. It’s a good thing I don’t believe in curses; several years ago, I noted that ZiPS was rather cruel in assigning Carlos Gomez as Buxton’s top offensive comp, but it’s been more on-target than a computer can understand. One of the problems with having a team full of average players is that it becomes damned hard to upgrade. There’s nowhere in the lineup where the Twins can be improved by any significant margin by adding a two-win player; really, even a three-win player would be an underwhelming addition at most positions. To upgrade the team’s offense, they need to add a legitimate star. And if that’s less likely to come by way of giant breakouts from Sano or Buxton than it once appeared, money becomes the best option in the short-term. After chasing Yu Darvish last year, I thought the Twins might sneakily be real players in the free agent market this offseason, but they really haven’t been. In a division with three rebuilding teams and a Cleveland squad whose plan in the outfield includes a heavy dose of Jordan Luplow, it feels like Minnesota should be more carpe diem and less dimitte diem. The theme of being largely average continues with the pitching staff. Only Jose Berrios (at 14-10, 3.93, and 3.2 WAR) really pushes out of that middling range in the rotation. While his 2018 looked vaguely similar to his 2017, Berrios bumped up his strikes by a batter a game, and it still feels like that he has some ceiling left, even if ZiPS sees him continuing to pitch at about the same level. Berrios’s changeup has always looked nastier than it’s actually played on the field. I can’t speak for Twins fans, but to me, it’s looked like a pitch that should have struck out more than a mere 15 batters (against 11 home runs) in the right-hander’s brief career. ZiPS remains unexcited about Blake Parker — one of the Twin’s “big” offseason moves — getting the highest-leverage innings, and instead sees Taylor Rogers or Trevor May (higher upside) as being better suited for the role. The projections are also bullish on Andrew Vasquez, a big lefty who serves up more sliders than White Castle and who rose from the Florida State League to the American League in ten weeks. But overall, the back of the bullpen looks shallower than other contenders’ and the highs are not quite as high. Of the teams that look to be around .500 or better, ZiPS projects Minnesota’s bullpen to be around the bottom, along with the Washington Nationals. Nick Gordon‘s offensive development has been a bit spotty, but ZiPS still sees him as a league-average regular in his prime, on the level of a slightly-better Polanco. That’s fine, but Royce Lewis’s projection is more exciting, with ZiPS seeing him peak as a 20-25 home run hitter, with projected lines in the .260/.330/.460 range, which will still work if he ends up playing center field rather than short in the majors. He even projects as useful if he were to play in the bigs this year, which is an impressive feat for a player with two months of Hi-A experience. As for Alex Kirilloff, while ZiPS doesn’t see him ever being a high-OBP player when his batting average inevitably comes down, his prime projections check in with just over a .280 batting average, with slugging percentages peeking just over the .500 mark. One pedantic note for 2019: for the WAR graphic, I’m using FanGraphs’ depth chart playing time, not the playing time ZiPS spits out, so there will be occasional differences in WAR totals. Ballpark graphic courtesy Eephus League. Depth charts constructed by way of those listed here at site. Disclaimer: ZiPS projections are computer-based projections of performance. Performances have not been allocated to predicted playing time in the majors — many of the players listed above are unlikely to play in the majors at all in 2019. 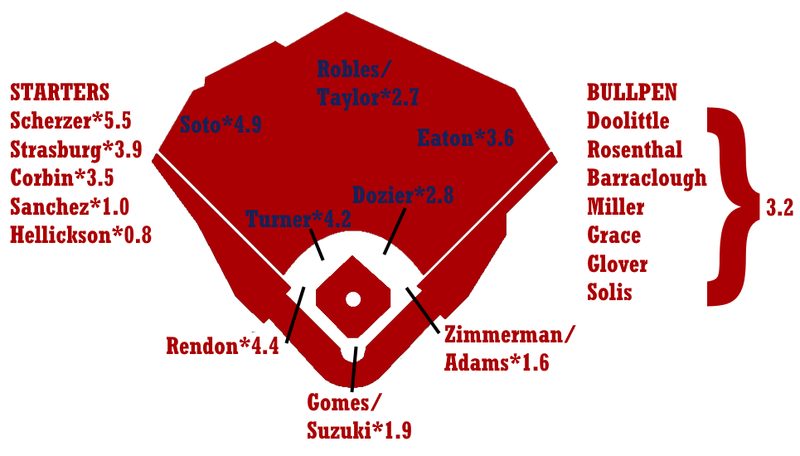 ZiPS is projecting equivalent production — a .240 ZiPS projection may end up being .280 in AAA or .300 in AA, for example. Whether or not a player will play is one of many non-statistical factors one has to take into account when predicting the future. Players are listed with their most recent teams, unless I have made a mistake. This is very possible, as a lot of minor-league signings go generally unreported in the offseason. ZiPS’ projections are based on the American League having a 4.29 ERA and the National League having a 4.15 ERA. Players who are expected to be out due to injury are still projected. More information is always better than less information, and a computer isn’t the tool that should project the injury status of, for example, a pitcher who has had Tommy John surgery. Both hitters and pitchers are ranked by projected zWAR — which is to say, WAR values as calculated by me, Dan Szymborski, whose surname is spelled with a z. WAR values might differ slightly from those which appear in full release of ZiPS. Finally, I will advise anyone against — and might karate chop anyone guilty of — merely adding up WAR totals on a depth chart to produce projected team WAR. After having typically appeared in the hallowed pages of Baseball Think Factory, Dan Szymborski’s ZiPS projections have now been released at FanGraphs for more than half a decade. The exercise continues this offseason. Below are the projections for the Washington Nationals. When I saw the Washington Nationals towards the end of the randomly generated ZiPS order back around Thanksgiving, I thought to myself, “There’s no way that Bryce Harper appears in those projections unless he re-signs.” But here we are! Even more surprising is the degree to which ZiPS has fallen in love with Juan Soto, leaving Bryce Harper as merely the second-ranked player on the Nationals’ list. Young players don’t get the Ken Griffey Jr. offensive comp very often. In fact, I think Soto is the first player to get Jr. as his top comp at this early an age. Comps to Griffey in his thirties tend to be more common (Edwin Encarnacion got him as his No. 3 comp). What you have here is a lineup in which the cream is very…uh…creamy. Soto’s projections rank him the No. 1 left fielder in baseball among the teams whose projections have gone live and I don’t think I’m giving any spoilers away by saying that neither Kyle Schwarber or Brett Gardner will have better projections. Anthony Rendon won’t drop below fifth among third baseman and there’s nobody left to push Trea Turner below the bronze at shortstop. That give the Nationals three players with a mean projection that makes them legitimate stars. 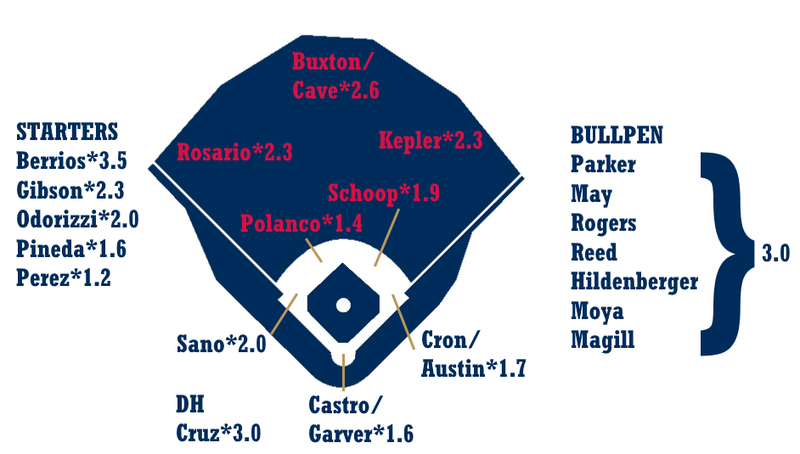 The supporting cast is pretty good, too: Eaton’s at the back of the top 10 if he can stay healthy, ZiPS projects a decent bounce back campaign from Brian Dozier, and catcher and first base don’t drag the team down. Victor Robles isn’t projected to make as big a splash as Juan Soto, but is still soothsayed as an above average center fielder as a rookie. The pitching bears a resemblance with the lineup in that the highs here are very high. You could do a lot worse than your top three starters having Greg Maddux–Bret Saberhagen–Andy Pettitte as a set of comps. And as weird as it sounds, ZiPS may even be slightly underrating Patrick Corbin; if I used a beta version of ZiPS that is probably a year away from going live, Corbin’s 3.63 ERA would drop to 3.42 and he’d go from the 16th pitcher ranked so far to the 12th. The difference is the full implementation of plate discipline data, which shows Corbin was the second-hardest starting pitcher (min. 100 innings) to make contact against in 2018. It’s easy to cruise on your team’s defense or a lucky BABIP; it’s much harder to cruise by fooling batters, and Corbin doesn’t use a novel trick that might cause him to have a short shelf life. After the top three starters, ZiPS is unimpressed with Anibal Sanchez and Jeremy Hellickson. ZiPS would actually slightly prefer that the Nats use Erick Fedde and Joe Ross in those slots, but none of them are all that exciting. Ross was at one point, and he’s young enough to still recover, but his career was waylaid considerably by injury. The bullpen is pretty much the same story. After Sean Doolittle (who has the 7th best projected ERA+ in baseball so far, though Yankees ‘pen is still to come) and Trevor Rosenthal, there’s a whole lot of meh going on. The only relief pitcher who really makes the computer feel a little flush is Austin Adams (there are two Austin Adami), a reliever with the classic mid 90s-fastball/slider combo and another classic trait of many hard-throwing minor league relievers: frequent control issues. Last year, Adams made real progress with his control, getting his walk rate under four in Triple-A while striking out 15 batters per nine innings, though Washington showed little interest in seeing what Adams can do. Washington never really seemed to have much faith in Felipe Vazquez or Blake Treinen either. One would think they’d have learned their lessons about not being more curious about hard-throwing strikeout machine relievers with command issues. ZiPS has the Nationals with the most WAR in the NL East, but does not similarly project them to be the first-place team. Simply put, ZiPS is unimpressed with team’s depth overall. This is due both to the reserves and the back of the bullpen, but also a minor league system that is likely to provide little in the way of additional reinforcements. Now, Robles is still technically a prospect, but he’s already considered here as a starter, not a reinforcement, and of the center field time split in the depth chart WARtoon, it’s Robles who makes up the bulk of the value rather than Michael Taylor. The one exception is Carter Kieboom, a player who ZiPS thinks could backstop an injured infielder quite adequately, and certainly be an upgrade from Wilmer Difo, who would be the likely replacement if injury strikes a Turner or a Rendon (something which has happened before). Long-term, ZiPS projects a lot of power upside from Kieboom, thinking he’ll get into the twenties in home runs a year fairly easily, with peak WARs that suggest multiple All-Star appearances. After that, there’s very little in short-term value. The next-best position player in the minors for the Nats, at least in terms of how ZiPS views 2019, is catcher Tres Barrera, projected to hit .228/.287/.355 for a 0.3 WAR in just under 300 plate appearances (which will almost certainly all be in the majors in 2019). And really, if a catcher was injured, whichever of Kurt Suzuki and Yan Gomes is healthy is likely to simply take over most of the additional playing time. After having typically appeared in the hallowed pages of Baseball Think Factory, Dan Szymborski’s ZiPS projections have now been released at FanGraphs for more than half a decade. The exercise continues this offseason. Below are the projections for the Colorado Rockies. Amusingly, Colorado’s lack of ambition this offseason may be counteracting their inability to evaluate their offensive talent. The team signed Daniel Murphy to a contract that is eminently reasonable for a player who is projected to be something like a league-average first baseman over the next two years, but has made no other significant moves. The 1.7 WAR projection for Murphy is only over 118 games, reflecting that there is some risk given that injuries limited him to just 91 games in 2018; he’ll turn 34 in April. Murphy obviously isn’t Paul Goldschmidt, but after the allowing the position to act as an Ian Desmond vanity project, leading to a -0.7 WAR and an 81 wRC+ from their starting first baseman, the Rockies should enjoy a larger improvement than most teams would have from signing him.